From Jane McCarthy ... Happy New Year Ilkley Harriers! 2016 has now finished and the League Results have been calculated and IT WAS VERY CLOSE AT THE TOP ... Congratulations to Overall League Winner Lucy Williamson - who took top place by just 6 points from Steve Murray in 2nd place and Peter Lewis in 3rd. Lucy also secured the top place in the Road league, while congratulations go to Jack Wood in Fell and Adela Reperecki in Trail. Full results attached. 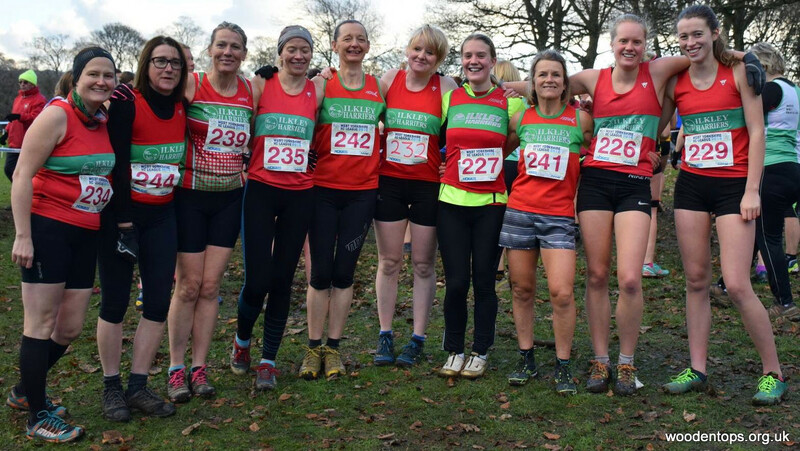 It was a fantastic turnout from Ilkley Harriers across the year in the League races, with 162 members running at least one league race. 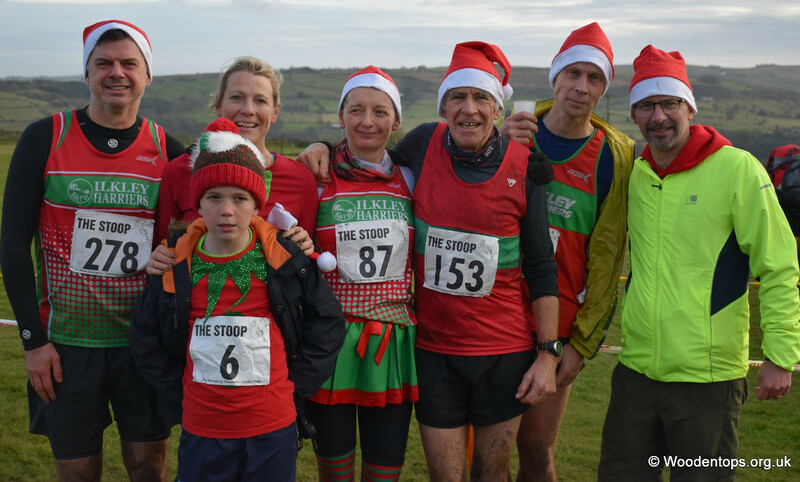 There's another great year of races in 2017, kicking off with the Stanbury Splash in January, so get some dates in your diary! Hoping to see many of you at the Social an Awards Do on 27th January. Tickets will be on sale on the website here shortly. From Petra Bijsterveld ... The last parkrun results of 2016 follow below. Whilst in the past all results from parkruns have been listed, both junior and senior, going forward only the results from those aged 16 and over, i.e. in the senior club, will appear here. This simply brings the parkrun results into line with how we report all other races. Please note these are (unusually) gun times rather than chip times. Chip times can be found for each runner by clicking on their individual results on the results website. From Petra Bijsterveld ... Christmas Eve saw some excellent Harrier results in adverse weather conditions at local parkruns, with a first place finish at Bradford for junior Cameron Reilly, and at Skipton Dan Hayes and Alex Hirst came 2nd and 3rd respectively. Conditions at Harrogate were particularly challenging with an icy strong wind and horizontal driving rain making us feel more as if we were running across the Siberian steppes than the genteel Stray. I cannot remember ever being so cold and wet on a run, not helped by my elf outfit not really being the most sensible choice of clothing. There was a timing issue with around 20 times between being lost from the official results, amongst them Steve Weston's, but he reports coming in 73rd. Nice to see Justin Philips and Julie Elmes who have recently left the Harriers, much missed! From Peter Lewis ... 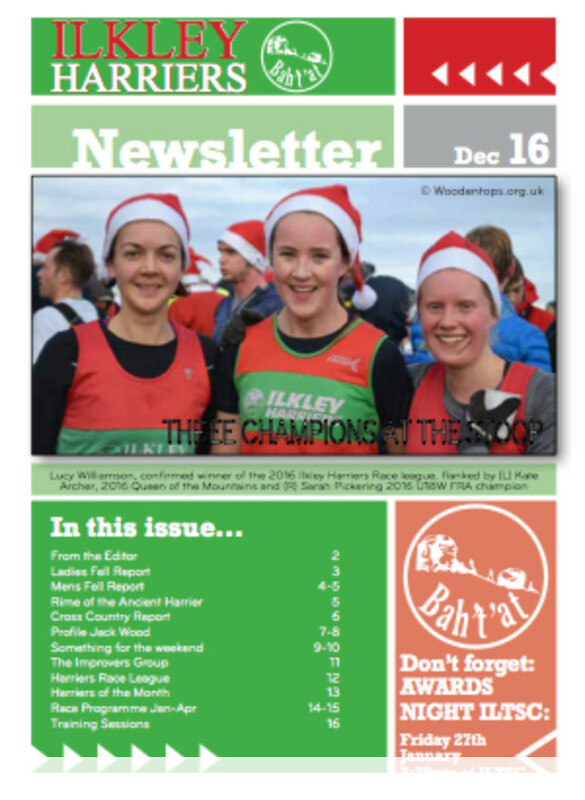 Your brand new Harriers newsletter is here in time for Christmas. We have changed to an electronic read format that you can download and print if you wish. We hope you enjoy it. For those of you who still hanker after print there will be some printed paper copies available from Hilda on a Tuesday night. This was the final counter in the Ilkley Harriers Race League (calcs later). Many fine Ilkley Junior results too.